Snake kills and eats mice, that sound normal to me. But how about a mouse kills a snake, and the snake was a venomous viper. Now i got your attention. This is a story about a great and strong mouse found in Taiwan. The snake was found by the firefighter and it then being kept into a mouse cage. For the lunch, the firefighter put a mouse inside the cage for the snake's meal. The incredible thing happend here. 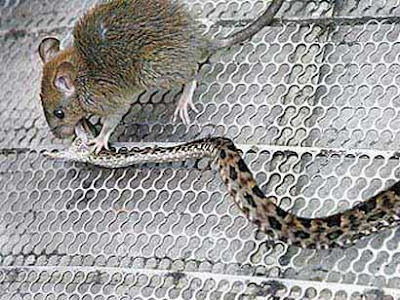 The mouse become extremely aggressive, it started attact the snake, biting, scratching and it kept kicking the viper's bud.~~haha..
Then after 30-minutes of miracle fight the snake was dead. Now that was an motivational story for my. How a small, weak and always known as a victim to the snake, becomes a super-mouse and kill the most scared creature known for fearsome reputation. Moral of the story : To survive in life, doesn't matter who your rival will be, give all your best and never give up. **the snake was smaller than the mice. that may be a logic to it's death. 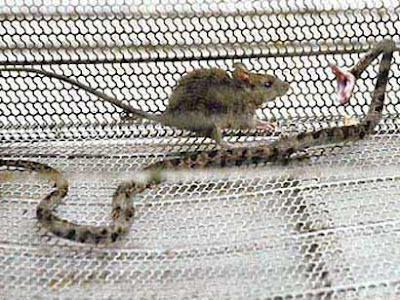 A tiny mouse was thrown into a cage as food for a viper - but turned the tables and killed the snake instead. Firefighters in Nantou town, Taiwan, caught the 35cm snake and put it into a mouse cage for safe-keeping. "We then found it a mouse for lunch," a spokesman for the team told Apple Daily. But the firefighters were stunned to see how aggressive the mouse became once it saw the predator in the cage. "It attacked the snake continuously, biting and scratching it," the spokesman added. After a vicious 30 minute battle, the snake was dead and the mouse was left with hardly a scratch. Lan Sengqiu, the chief fireman, added: "Perhaps it used up its venom when we caught it, and perhaps it was a novice predator."